The village of Palekh was known in the 19th and early 20th centuries as a place for marvelous miniatures of both icons and secular art. This icon is from that time and place, and has bright and vibrant colors to express this solemn event on our salvation history. Christ has just died, and His eyes are closed in rest after His Passion and Death on the Cross. Behind Him are the towers of the City of Jerusalem and its walls. The Virgin Mary and two of the Myrrh-Bearing Women stand below His right side with water and His Blood still flowing down to touch the skull of Adam to begin Adam’s re-entry into Paradise and release from Hades. St. John, the Beloved Disciple of the Lord, looks up to see everything here as he was a witness, who when he recounted these events many years later, could say with conviction, “And he that saw it bare record, and his record is true: and he knoweth that he saith true, that ye might believe” (John 19:35). The Centurion Longinus who had pierced Christ with a spear was also a witness, and he confessed with faith and love to all there, “This Man was the Son of God” (Mark 15:39). 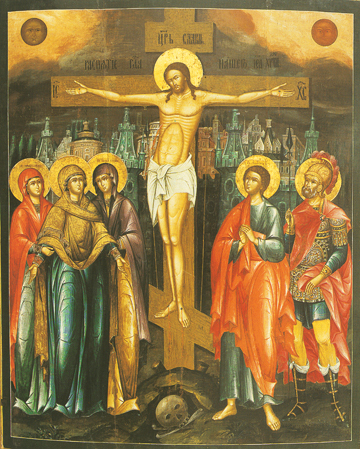 May we confess our faith now, too!Here is an early 19th c. icon of the Crucifixion from the Palekh School. We see the Lord peaceful in death, as He enters His secret Glory still hidden from the world at this time, while the Virgin, St. John, St. Longinus, and two Myrrh-bearing women look on.